The recipe is very easy to make. It takes a bit of chopping, but once that’s done, just let the dish simmer until you’re ready to eat. 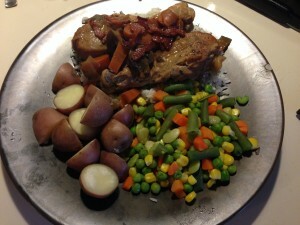 The second time I made this, I made a double batch of the sauce overnight in my large slow cooker. The longer cooking time lead to a darker sauce and the vegetables broke down more, but it was still tasty. Also, because the steam couldn’t escape the crock pot, the sauce was thinner. However, whether cooking for a longer or shorter period of time, in a pot versus a slow cooker, the recipe is going to turn out tasting great. There are a lot of variations on chicken in beer on the web. If you search for “chicken in beer,” you’ll get a bunch of beer can chicken recipes. Search instead for “coq à la bière,” the French term for the dish. (You don’t need the diacritical marks for a web search.) As you’ll see from browsing through them, there are a lot of variations, so don’t be afraid to make some recipe adjustments of your own. There’s no use buying an expensive Belgian witbier for this recipe, or even using good homebrew (unless you’ve got some to spare). For the witbier, I used Shiner White Wing because it was relatively cheap — at least compared to Belgian imports — and a little spicier than Blue Moon or Shock Top. 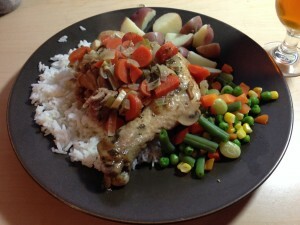 A savory chicken recipe, made with witbier. The coriander and orange peel in witbier add to the flavors in this dish (and you’ll sure smell them as the sauce cooks). When you’re ready to serve, cook the rice and put it on a plate. Take a leg quarter and put in on the rice. (The longer you cook the dish, the more the chicken will have a tendency to fall apart. So be gentle when extracting the pieces from the sauce.) 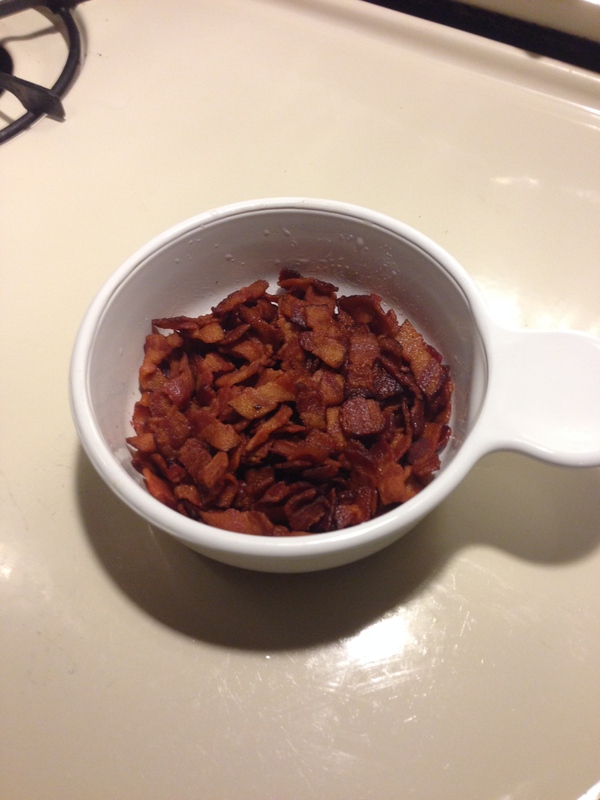 Ladle some sauce over the chicken and sprinkle with bacon bits. You can reheat the bacon bits in the microwave. Serve with beer. A witbier is a good choice, but any malty beer would go well with this, I think. You can serve the potatoes on the side, or wait until 30 minutes before the dish is done and chop and add them to the sauce at that time. If you can’t find chicken stock, you can use chicken broth, but stock is going to make for a thicker sauce. If you want a thicker sauce, simmer it longer before frying and adding the chicken. You could also try adding a little more flour or corn starch.